Love Vail in the winter? You have to try it in summer. You might never want to leave. If, that is, you fall prey like several other mountain lovers, and now Coloradoans (is that how you say it, or is it Coloradans?) who embody the phrase, "come for the winter, stay for the summer." You can't ski until next season--unless you're late spring skiing at A Basin, Loveland, Snowbird, Blackcomb, Mt. Hood or Tahoe--but don't let that stop you from visiting once mud season subsides. OK so it might be awhile considering that Vail was still getting snow on April 25, the day after the mountain closed for the season, and Denver's temperatures are in the 30s today, which can only mean it must be colder in the mountains. But I think it's safe to say it's worth waiting for, especially if you're like me and searching for that golden opportunity for summer sporting. 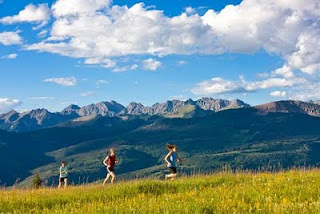 I always knew that Vail, Colo., turned into a hiker's haven and a mountain bike mecca when the snow melted. It's practically a given provided all the ski trails on the mountain. But what these Top 10 Fitness Finds in Vail helped me find was there was a whole lot more than hiking and biking. And for someone who dreams far too often of moving out there, the other eight activities helped provide some bargaining chips to sway the other party in my direction. If you thought you could burn calories all day skiing on the mountain, you'll have to check those top 10 from buzz.snow.com. Maybe then you'll be planning a vacation or escape out to ski country in the summer, too.